A 58-year-old Haitian man walks out of his apartment into the hall, causing a ruckus and making noise. He has a history of mental health issues and is believed to have a screwdriver or knife in his hand. But Pierre Coriolan shows no signs of being violent or possibly having vicious intent with the weapon. Still, while he is outside of his apartment, he gets tased and shot by the police, and he dies. In a video of the June 2017 incident, we can see how lazy and careless the five police officers, who seemed in disarray, acted when dealing with Coriolan. They did not make a concerted effort to try and communicate with the victim, and decided to use a stun gun, plastic gun, and eventually their actual guns in order to subdue the distressed man. Although he had what was believed to be either a knife or screwdriver in his hand, there was no need to shoot him multiple times in order to subdue him—especially with five police officers present. Each of them alone should have been trained enough and more than capable of reprimanding Coriolan without having to shoot and kill him. Although some might argue that Coriolan could be perceived as a threat because he had a history of mental illness and had a weapon in his hand, the situation simply calls into question what exactly these police officers are being taught when it comes to dealing with people with mental illnesses or who seem unstable. Coriolan’s family members are suing the city of Montreal for roughly $163,000, and rightfully so. A man lost his life because of police officers who were not determined to preserve it, as they should be. The death of Coriolan was not an isolated incident. 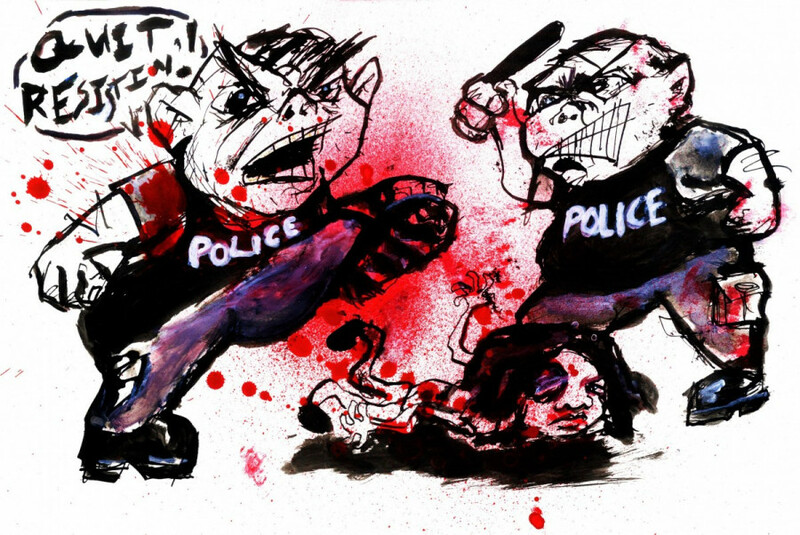 In 2014, in another example of police brutality in Montreal, Majiza Philip, a Black woman, was brutally beaten by police and suffered a broken arm after trying to ask officers why they arrested her friend, who was white and was not treated with the same level of viciousness. It is detrimental to a society to have people carelessly lose their lives because police officers aren’t educated on how to deal with unstable people. Perhaps we should take notes from countries such as Iceland and New Zealand, who are ranked the top two countries in the world in terms of safety and whose police officers do not carry firearms. If police in Auckland, New Zealand can serve and protect with a population of 1.4 million without firearms, then so can Montreal police. There issue isn’t just with police brutality and how to reprimand people without severely injuring them, but Montreal police officers have failed to address the racial profiling issues they planned to tackle five years ago, according to a report commissioned by the SPVM. The report further shows that police have been unsuccessful in being diverse when hiring officers and also have failed to keep track of racial profiling complaints. Currently, under 10 per cent of Montreal police officers are visible minorities in a city where nearly 23 per cent of inhabitants are visible minorities, according to the 2016 Census. It is apparent that Montreal law enforcement still has a lot of room for improvement and should be more invested in learning how to properly handle people who are in a dangerous or difficult situation while preserving their lives as well as not letting prejudices impede their judgement. Where do we go from here? We can look to Ferguson, Mi. for guidance. Following the fatal shooting of Michael Brown by police officer Darren Wilson, an investigation began of the entire Ferguson police department, leading to its dismantling. There should be an investigation into the SPVM in its entirety to truly understand the issues of police brutality and racial profiling. It is very questionable that they have not charted how many times they have had racial profiling complaints. Although other Canadian police forces don’t keep tabs on racial profiling either, Toronto police officers keep track using data which shows that Black people are overrepresented in criminal charges. Maybe it’s time the SPVM does the same.